The historic surge in domestic oil and gas production has made it clear: The United States is poised to regain the top position as the world’s largest oil producer, a distinction it has not held since the early 1970s. What effect will this sea change have on geopolitics and will public policies support the energy industry’s drive to make the U.S. more energy self-sufficient? Read full article here. As documented at the Annual Shareholder’s Meeting and in multiple SEC filings, over the past several quarters Company leadership has been meeting with a broad spectrum of shareholders, institutional investors, brokers and private banks. To more effectively facilitate this process we have streamlined our Investor Relations platform and are developing documentation that describes the benefits that STWA’s solutions offer the industry and our business model for optimizing these opportunities. The first of these documents, the STWA Corporate Profile (Feb. 2014) is available for your review on our website here. Please also note that the Investors area of our website now provides a central location for shareholders and other interested parties to gain quick access to stock information, SEC filings, documents, tear sheets, photos and other content. As always, we thank you for your support and look forward to your continued comments. 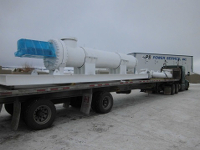 Following assembly and testing at our supply chain partner’s fabrication facility in Casper, Wyoming, the AOT Midstream was loaded on seven flatbed freight trucks and delivered on February 12th to the pipeline site in Kansas where it is now being prepped for installation. Photo: STWA, Inc.